She’ll be joining the agency’s celebrity division. Nicki Minaj is now a model, professionally. According to Vogue, the rapper has signed with Wilhelmina Models under their celebrity division. 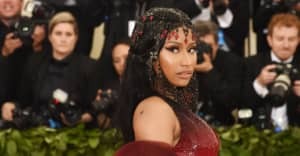 Minaj has previously been the face of Roberto Cavalli, and with 77 million Instagram followers, she's fairly accustomed to posing for a camera. This is the latest achievement for Minaj, who just last week passed Aretha Franklin for most Hot 100 hits by a female artist. Thumbnail image via Ethan Miller/Getty Images.